One of the greatest challenges when teaching students how to create documentary films is trying to get them to construct a story arc from the material they’ve gathered. The students spend weeks recording video and audio and by the time they are ready to get down to actually editing the material together, they are often overwhelmed. In this post we will describe a process that we have developed (really, borrowed and adapted) that has helped the students organize the evidence and then create the argument. The first step actually occurs before the editing process begins, and is more of a guideline for the students to follow when they go into the world to film. We try to tell them that they have no idea what to expect. They don’t have a script, a set, a cast, or a storyboard. The world will provide them with the material that they must then assemble into a story. This means that they have to constantly be looking for shots that might be good. We try to get them to pay attention to what is being said in the interviews. This could give them ideas for inserting a relevant cut-away shot. For example, if an interviewee is talking about how they start their day with the routine of making coffee in the morning, then it would be a good idea to ask the interviewee if they could demonstrate that process – and then film it! The students generally hate this process, but learn very quickly why this is crucial. We supply the students with a simple GoogleDoc that has four columns. First is just an identifier that uniquely identifies the clip. The next two columns identify the starting time code and ending time code for the section inside the clip that contains a specific piece of information. For example, the students may have filmed an interviewee talking about their love of coffee and how it has shaped their life. In the single clip of the entire interview, there are several different pieces of information. There is a section where the interviewee is talking about the different roasts of bean and how that changes the flavor, then they might talk about the well documented health benefits of caffeine. These two different pieces of evidence need to be identified separately in the log. The final column is just a short description of the content. Once the students think they have all the material they need. The next step is to transfer the information that is in their filming logs to sticky notes. Yep, low tech baby. This is actually an eye opening experience for the students. It gets them to clearly see how much material they have (or don’t have). We give them three different colors of sticky notes. One color represents interview footage, one color represents footage that can be used to bridge interview footage, and lastly there is a color for audio narration. Typically, they don’t actually have audio narration at this point. The students then throw these sticky notes onto a whiteboard (thank goodness we have lots of whiteboard space!). The next step is to organize all this stuff. The students then stand back and take it all in. 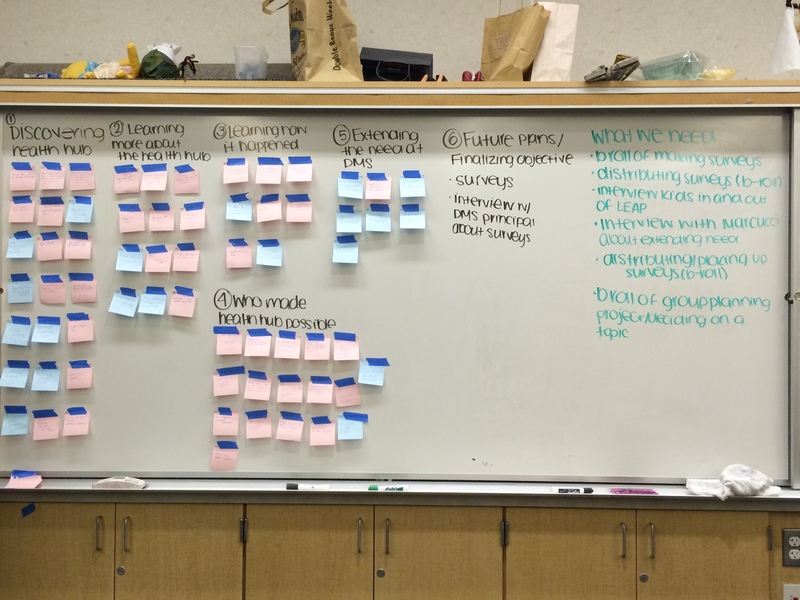 They are asked to organize the sticky notes into “bins” that represent distinct themes or ideas. For example – this might be “Health Benefits”, or “Art of Roasting”. Clips from several different interviews will appear together in these bins, combined with supporting cut-away shots and other bridging shots. This is where the students really start to visualize their story arc. They begin to see how the chaos could be connected together into a cohesive narrative. They also start to recognize the gaps. They start to see how the story might unfold. The final step is to take the material in the bins, and to construct a sequence. Rather than being overwhelmed by the individual clips, they can visualize their story as a connection or sequence of bins. This is where they identify what might still need to be filmed in order to connect the sequence and what material they have that needs to be “thrown out”. We don’t actually suggest that they throw any of their footage out, but rather put it in “reserve” just in case. Its a lengthy process, but we are convinced of its value. The students tend to grumble and groan about the tedium of the process, but ultimately they agree that the clarity they gain is worth the time. We suspect that the process also helps them become better writers and better communicators, and well, that’s really the main point!